Lincoln Cathedral and the International Bomber Command Centre have joined forces to share heritage with local schools. 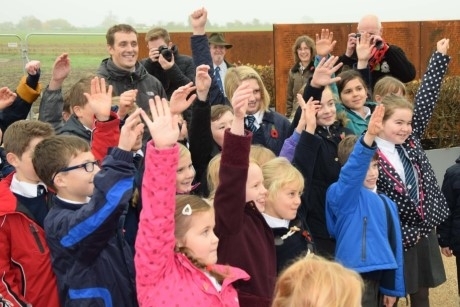 Lincoln Cathedral and the International Bomber Command Centre (IBCC) have launched a joint learning offer, giving school groups the opportunity to visit two sites with a shared heritage, exploring themes of remembrance, duty and sacrifice. What will the visits incorporate? Schools can book a hands-on learning day for any day of their choosing, which will run from 10am to 2.30pm. The day will begin at the International Bomber Command Centre, where children playing the part of historical detectives will discover the story of Henry Simpson, brought to life through artefacts in the handling collection. Pupils will have the chance to try on uniforms and handle authentic World War Two documents. After lunch at Lincoln Cathedral, pupils will be able to explore the Airmen Service Chapel. They will view the Cathedral’s own books of remembrance, with Henry Simpson’s story coming full circle. With inspiration taken from the Bomber Command window, pupils will create their own stained glass inspired masterpiece. A Heritage Lottery Fund has backed the project to radically improve the Cathedral’s setting and visitor experience. The project, Lincoln Cathedral Connected, aims to engage people in the Cathedral’s past, archaeology and architecture through activities and events to educate, inspire and inform. Teachers can email education@lincolncathedral.com to book a visit. For more information, visit www.lincolncathedral.com and www.internationalbcc.co.uk.